What exactly are kidney stones? How are they formed? How do you treat them? And what does it all mean for your Miniature Schnauzer's health? Kidney stones are mineral deposits that form overtime and although less common than bladder stones, if fragments of stones interfere with fluid flow, they can cause serious complications for your Miniature Schnauzer. To understand why these deposits form, we must first understand how the kidneys work. The kidneys perform several influential duties for the body. Their main job is to maintain a balance of chemicals in the blood by filtering out the excess minerals and toxins as urine. So blood enters the kidneys and the filtration process of blood begins. The waste collected and removed produces urine. The urine drains from the kidneys through a system of tubes (ureters) into the bladder. The bladder serves as a holding sac until a certain amount of urine has been collected. When the bladder becomes full, it sends a message to the dog that it is time to release the urine and the dog will have the urge to eliminate. When the dog urinates, the excess minerals and toxins of the body are released. The urine leaves the bladder and drains to the outside through the urethra. The photo below shows this entire process... from the kidneys, urine travels down the ureter into the bladder. 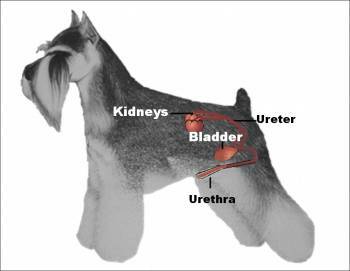 As the bladder fills your Schnauzer gets the urge to urinate and sends the urine out of the body via the urethra. When the kidneys lose their ability to keep out the excess minerals, crystals begin to form. Although small at first, once a stone begins to grow in size, it can block a dog's ability to eliminate the impurities from the kidneys. This blockage will cause your Schnauzer severe pain and he/she will need medical attention right away. This is a very serious condition. So if your Schnauzer begins to exhibit any of the above warning signals, take your dog to your vet immediately. Your Vet will do a complete blood count, urinalysis, as well as take x-rays and perform ultrasounds on your Miniature Schnauzer to identify the mineral content of the stones as well as, determine the size, shape and location of the stones. Treatment for kidney stones will vary but it will probably include putting your Miniature Schnauzer on antibiotics, fluid therapy, and/or a special diet (which must be adhered to explicitly). After a few weeks of treatment the stones should begin to dissolve. If not, surgery may be necessary. There are a number of causes and risk factors that may contribute to the formation of stones in the kidneys. If your Vet can determine the underlying cause(s), (genetics, diet, medications, urinary tract infection, etc…) treating and controlling these factors may help prevent your Miniature Schnauzer from suffering any re-occurrences. Urolithiasis is the condition where stones form in the urinary system (stones of the kidney and bladder). The most common types of stones found in dogs are struvite and calcium oxalate. The Miniature Schnauzer is considered a high risk breed for developing stones. 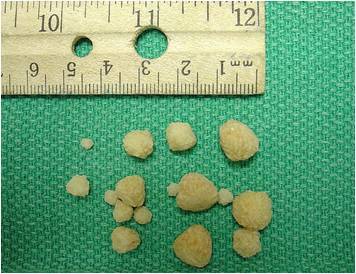 Females are more more susceptible to developing struvite bladder stones and males, calcium oxalate stones. Struvite stones are comprised of magnesium, ammonium and phosphate and account for more than one-third of all stones found in the urinary tracts of dogs. They are almost always accompanied by bacteria that create a high alkaline pH. • Avoiding alkaline foods (bananas, apricots, cabbage, green beans, broccoli, asparagus, beets, sweet potatoes, zucchini, squash) may help prevent such stones from forming. • A more acidic diet would include foods like chicken, beef, eggs, fish, yogurt, cottage cheese, brown rice and beans. 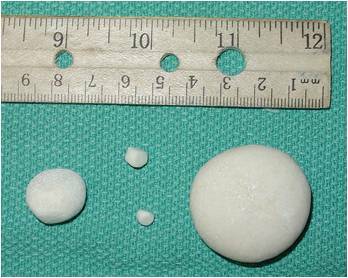 Since most struvite stones form when there is a bladder infection, the general rule is... no infection - no bladder stone. • Avoid Feeding Your Dog these High Oxalate Foods: asparagus, beets, broccoli, carrots, collard greens, green beans, okra, peanuts (peanut butter) summer squash, blueberries, soy products, spinach, sweet potatoes. • Acceptable Foods to Feed Your Dog: chicken, turkey, eggs, rice, pasta, cabbage, cauliflower, peas, bananas and melon. Diet will not dissolve calcium oxalate stones but may help prevent new ones from forming. Also cortisone medications should be avoided as they can increase the risk of stone development. Surgical removal of these type of stones is usually necessary. Prevention is always the best medicine. Here are some tips to help keep stones from forming in the first place. ★ WATER: Be sure to always have pure, clean, filtered drinking water available for your Schnauzer. You can also buy distilled water and even add some to your Schnauzer's food. ★ ELIMINATE: Dogs prone to urinary tract infections should be allowed to relieve themselves more often. 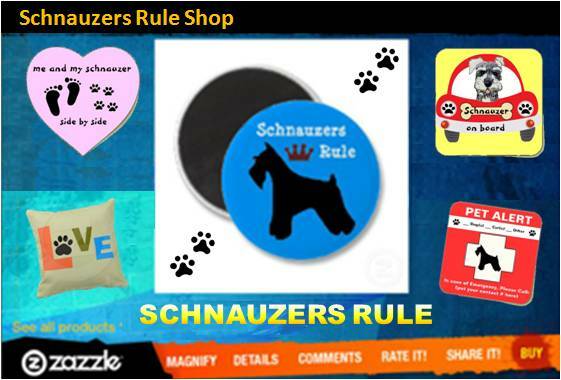 So let your Schnauzer outside every hours so he can relieve himself. ★ DIET: Since prcessed foods contain chemicals, consult with your veteriarian about a more natural diet for your Schnauzer that could include chicken, eggs, and fish. Also ask your vet about adding dietary supplements like apple cidar vinegar or cranberry extract to your dog's drinking water. ★ DETOX: Eliminate toxins naturally. There are several things you can do to help detox your dog. And by making a few simple life changes, you'll help to alleviate some of the stress placed on the organs responsible for removing toxins, like the kidneys. Maintains the normal production of certain hormones, including those involved in red blood cell formation and blood pressure regulation. Drops may be mixed into a small amount of food or added to a bit of water and syringed into your pets mouth 2-3 times per day. "Knowledge Share"... If you found this article on the Kidney Stones in Dogs helpful and informative, please share it with your dog-loving friends by clicking on one of the share links (like facebook, twitter, and google +1) located at the top right or bottom of this page.